The end of the month but the start of an epic journey which will take us clean across Canada. We left the spring flowers and warmth of Victoria in British Columbia on May 14, 2007 and have spent the last two weeks crossing Canada to arrive at the starting point of our journey - Newfoundland. So far we've clocked up over 7,100 kms in the last two and a half weeks, and collected enough experiences to write a small book. Right now we are cruising the Atlantic Ocean between North Sydney in Nova Scotia to Port aux Basques in Newfoundland a crossing which takes 5-6 hours. It's a beautiful sunny day albeit a little breezy and the Atlantic is very calm. Spring hasn't quite arrived in Nova Scotia yet and from what we've heard it's not quite in Newfoundland either. Our original plan was to zip straight across to the Avalon Peninsula of Newfoundland (as far east as you can go) and begin our production there however, our plans have changed. Now we will work our way eastwards (in Newfoundland) so that when it's time to leave Newfoundland the ferry from Argentia will be operating by then to return us to North Sydney in Nova Scotia. This alternate ferry operates from Mid June through to September and the journey takes approximately 14 hours. After a few hours at sea, we finally saw land - Newfoundland, and before long all passengers were returning to their vehicles, ready to drive off. As soon as our tyres hit solid ground, we continued our journey to Corner Brook approximately 2 1/2 hours further north. Once we arrived in town and briefly checked it out, we drove on to the western end of the South Shore of the Humber Arm towards Lark Harbour. Passing through Lark Harbour we had our aim set on Blow Me Down Provincial Park as a possible place to stay overnight however, when we arrived the Provincial Park had not opened for the season (June 1). 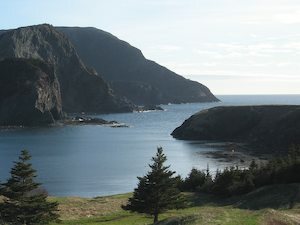 We decided to continue on and check out the end of the road and made it as far as Bottle Cove, a beautiful protected cove with rugged rocks at the entrance. This was the view from our camper! !